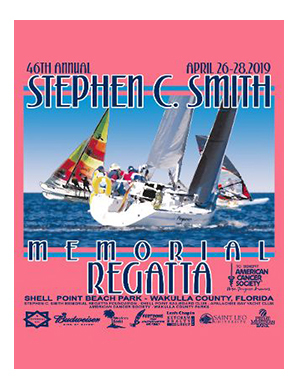 2019 is the 46th Annual event for the Stephen C. Smith Memorial Regatta, held for each of the past 45 years at Shell Point Beach on the Gulf of Mexico in southern Wakulla County. This year's event is scheduled for April 26 - 28, 2019. The Stephen C. Smith Memorial Regatta Foundation, Inc. is a 501c3 nonprofit organization that presents the regatta annually for the benefit of the American Cancer Society in memory of Stephen Smith, a local sailor who died from a rare form of leukemia at the age of 29. The 2018 event organizers are the Shell Point Sailboard Club (SPSC), the American Cancer Society (ACS), the Apalachee Bay Yacht Club (ABYC) and numerous businesses and individuals. Thanks to our MANY wonderful supporters and volunteers the Stephen C. Smith Memorial Regatta Foundation was able to donate $19,000 last year to the local American Cancer Society branch. THANK YOU! Our goal this year is to match or beat that amount, so please help us make that happen. To join our team or to donate auction items, contact the event chairperson. The Regatta has drawn as many as 200 registered participants and hundreds more spectators from all over the southeast. The event includes: races for yachts rated under the PHRF handicapping system, catamarans such as Hobie Cats, smaller day sailors including Sunfish, and windsurfers, the most numerous and arguably the most colorful participants in the Regatta. Catamarans and one design day sailors, and small and large (22 feet and over) monohulls will race over their own courses as with the windsurfing fleet. Races are held both Saturday and Sunday (only windsurfers on Sunday), with other events for sponsors, spectators, and participants on Saturday night. The public is invited to view the races on Saturday and Sunday and get lunch at the Regatta Grille, and to participate in the auction of thousands of dollars worth of donated items on Sunday afternoon beginning after the trophy presentations (about 2:00 pm). Everyone can have a great time and pick up some great deals while making a contribution to help us all fight cancer. In addition to the many patient services provided to children and adults, the American Cancer Society funds research and public education, which is vital in the effort against this silent killer. The American Cancer Society receives no government funding and relies exclusively on the generous support of private donations. In the last five years, the Stephen C. Smith Memorial Regatta Foundation, Inc. has been able to contribute over $90,000 to the ACS, the majority of which stayed in the Big Bend area, providing educational programs and patient services to area residents. Businesses or individuals wishing to participate as sponsors will receive a receipt for their donation to a 501c3 foundation and other benefits appropriate to the level of support. Contributions may be made by donating items for the auction, in-kind merchandise to support the event, or negotiable funds. Donations will be recognized in the Regatta Program Booklet, on this website, and on the sponsor board. Can't make the Regatta? Then donate directly to the Smith Regatta Foundation. This webspace is provided, free of charge, by the Shell Point Sailboard Club, and we appreciate their contribution to the cause.